Scoliosis is an abnormal curvature of the spine from side to side. Most cases of scoliosis are mild. Everyone’s spine naturally curves a little bit, but people with scoliosis have a spine that curves too much from side to side and can look like the letter “C” or “S”. Scoliosis can begin at any age, but most often occurs during your teens. Scoliosis most often affects children between the ages of 10 and 15. Girls are more commonly affected than boys. Some scoliosis cases can continue to get more severe as the patient grows. Severe scoliosis cases can be disabling and reduce the amount of space within the chest cavity making it difficult to breath. In growing children mild curvatures can worsen quite quickly. Therefore, frequent checkups are often necessary for this age group. Children who have scoliosis can be monitored with X-rays, to see if the curve is getting worse. Signs and symptoms of scoliosis may include: back pain, one shoulder higher than the other, winging of the shoulder blade/scapula, one hip higher than the other, rotated body, difficulty breathing, when you bend forward one side of the spine is higher than the other (Adam’s Test). In severe cases Scoliosis can also affect the function of the heart. Every child should be checked for Scoliosis prior to their teenage years. If you suspect Scoliosis you should get your child checked. In most cases (80%) the cause of scoliosis is unknown. Scoliosis can be caused by an injury, poor posture, one leg being longer than the other, neurological disease (cerebral palsy or muscular dystrophy), tumors, or spinal deformities from birth defects affecting the development of the bones of the spine. Scoliosis can also be inherited. If you have scoliosis you should have your children evaluated by your chiropractor or health care professional. Evaluation should include orthopedic, neurological and chiropractic examination. Adam’s test is a test that anyone can perform by standing behind the subject and have them touch their toes and looking to see if one side of the back is higher than the other. If scoliosis is suspected then X-rays should be taken. 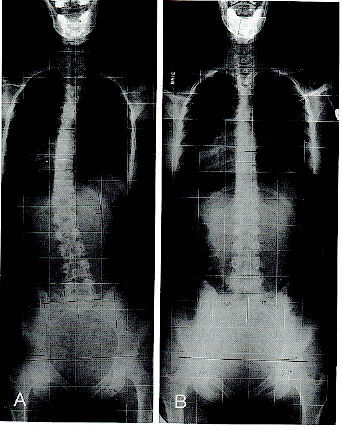 If the x-rays show a lateral (sideways) curvature of greater than 10 degrees the patient has scoliosis. Curves less than 10 degrees are often just postural changes. Scoliosis Treatment can consist of Spinal Adjustments to correct vertebral subluxations (misalignments); Therapeutic Exercises such as Stretching and Strengthening can help with muscular imbalances; Class IV Laser Therapy to reduce muscle spasm, pain and inflammation; Massage can help with tight muscles of the spine; Postural Correction Shirts can keep the patient aware of the posture and reduce spinal muscle fatigue from poor posture; Good posture and proper spinal biomechanics can limit worsening of the scoliosis; Orthotics with a heel lift can correct leg length discrepancies in those with a short limb.